Your home should be your haven, your safe place. It should be a warm, comforting and steadfast presence in your life that puts its arms around you and reassures you that the pressures of the world are far, far away. Central to the sense of domestic ease and tranquillity is the absence of intrusive extraneous noise. When that is not the case, when your feeling of calm relaxation remains elusive because of a level of sound that exceeds the threshold of acceptable, the impact on your peace of mind can be significant. Noise nuisance can be generated by a wide variety of sources – traffic, trains and anti-social neighbours, to name but three. Allowed to continue unchecked, the disturbance can make your home feel less like your home. Fortunately, there are ways to reclaim that peaceful space and make the excessive noise of the world outside go away. In this definitive guide to soundproofing your home, we will examine in detail the actions available to you if you want to ensure that noise nuisance is a thing of the past. Let’s start by looking at sound. If we understand what it is and how it travels, we will get a clearer idea of the measures we can take to minimise its impact. To put it simply, the sound is the energy produced when something vibrates. This energy moves away from its source in waves, which cause the air and any objects they encounter to vibrate too. In contrast with light, sound can travel quite easily through most objects. That’s why your room is dark when you close the curtains, but you can still hear cars on the road outside when the window is shut. Soundproofing works by putting extra obstacles in the path of sound waves. These layers reduce the energy of each wave, rendering it either inaudible or at least reduced to an acceptable level. Why do people soundproof their homes? To prevent noise from getting in: As we have discussed already, the effect of the sound of traffic, neighbours or music can impinge seriously on your quality of life when you are at home. It’s also worth taking into account that, when you come to sell your house, a lack of soundproofing can have a negative impact on its value. To prevent noise getting out: If you are a musician, or need a space where you can be loud for any other reason, you will be able to proceed with greater peace of mind if you know your neighbours will not be disturbed. These are the most straightforward measures you can take to ensure noise from outside your home will be at an acceptable level once it travels into the interior. Fix any holes or cracks in your walls: Take a good look at your outside walls, especially areas around window frames, ventilation grates and sockets. If the hole in question is the result of damage and you just want to fill it in, you can use expanding foam. However, if the task is complicated by the fact that the hole needs to be there in some form – say, for electrical or communication cables – it may be worth engaging professional assistance. Seal your external doors: Check to see if your door is hollow; if it is, either replace it with a solid door, or reinforce its panels. You can do this by attaching a piece of wood about half an inch thick to add a layer of insulation. An extra step is to apply some soundproofing rubber around the outside of the door. Replace or repair your windows: As you will see in further detail below, there are several options relating to upgrading your windows. Installing soundproof windows, or double glazing, with PVC frames, will make a significant difference to the amount of noise that makes it into your home. If you want to stick with wooden frames, having them repaired can also cut back on the nuisance you suffer. In this section, we’ll look in more detail at the specific steps you can take when you want to soundproof a particular room inside your home. Insulation: The insulating material is blown into an existing wall through holes drilled into it. You can use fibreglass insulation, which tends to dry more quickly, or cellulose insulation which is environmentally safer and non-toxic. Other materials that can be used include mass loaded vinyl, neoprene rubber and visco-elastic foam. Drywall: Adding a second layer of drywall to your existing interior walls will increase their thickness and enhance their soundproofing ability. If you make sure there is a film of damping compound between the two layers, it will create an even more efficient barrier against noise. Paint: Acoustical paint has been specially formulated using sound-absorbing resins, fillers and hollow ceramic microspheres. The result of applying a couple of coats is a reduction in noise of up to 30 per cent. Wallpaper: Similarly, you can find acoustical wallpaper that is hung in just the same way as normal wallpaper but can reduce noise by up to 75 per cent. When it comes to floors, there are two sorts of noise that can cause nuisance. Airborne sounds are those caused by voices, music or a TV – they are transmitted through the air. Impact sounds, meanwhile, are caused by something coming into direct contact with the surface, such as a dropped object or someone walking across the room. Airborne sounds can be tackled by filling cavities beneath the floor with sound-absorbing material such as fibre insulation. Impact sounds are harder to address, but the first thing to look at is the sub-floor layer beneath your carpet or wooden floor. If this can be made more flexible and resilient, it will absorb the noise of the floor to a far more satisfying extent. Another solution is to install acoustic floor mats across the surface, which will deaden the noise of footsteps or furniture being moved. It’s worth mentioning at this point that, while wooden floors look fantastic, if a board comes loose and begins to squeak it is soon extremely irritating. Keep your wooden floor in prime condition at all times. The same principles apply to the material at the top of the room as that at the bottom. Ceiling voids can be made more resistant to noise nuisance by installing soundproof panels or insulating materials. When sound waves are looking for a way into your room, the door is one of the most welcoming they can find. Fortunately, there are several steps you can take to ensure you lockout as much external noise as possible. Install a solid door: If the door to the room is hollow, it will provide a much reduced defensive layer against external noise. 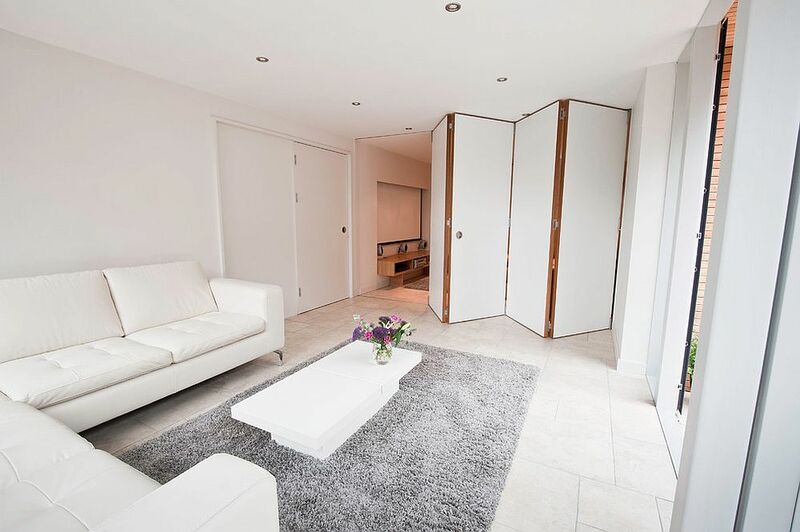 Fitting a solid door will make a substantial difference to the amount of sound coming through. Seal the gap: If you apply self-adhesive weatherstripping to the areas where the door meets the frame, there should be no space at all between them whenever the door is shut. Install gaskets: This is another solution to ensure the seal between the door and its frame is as snug as it can be – and drastically lessen the level of noise that finds its way through. Add a door sweep: This is a rubber loop that can be fitted to the foot of a door and will block the gap between it and the floor – like a built-in draught excluder. Use thick rugs or carpets on your floors to deaden the sound from rooms below – and the sound travelling to them from the room you have soundproofed. Put up heavy curtains that cover not just the windows but also the wall below and above. If the noise nuisance is emanating from behind one particular wall, that’s where you should place your largest pieces of furniture. Install a large bookcase. As well as being a barrier in its own right, the books on its shelves are also extremely effective when it comes to absorbing sound. The fundamental purpose of windows is to let as much natural light into your home as possible. Unfortunately, glass is not particularly effective as a sound-resistant material, which means your windows can be one of the main entry points for noise nuisance. However, there are several ways in which windows can be altered and upgraded so that they are no longer the chink in your soundproofing armour. In many ways, this is the simplest solution. All you need to do is remove the existing installations completely and fit in their place these specialised products, which are specifically designed to reduce the sound entering your home. Typically, soundproof windows are constructed using several layers of glass, with gaps between them. They are one of the more expensive solutions but they are also extremely effective. 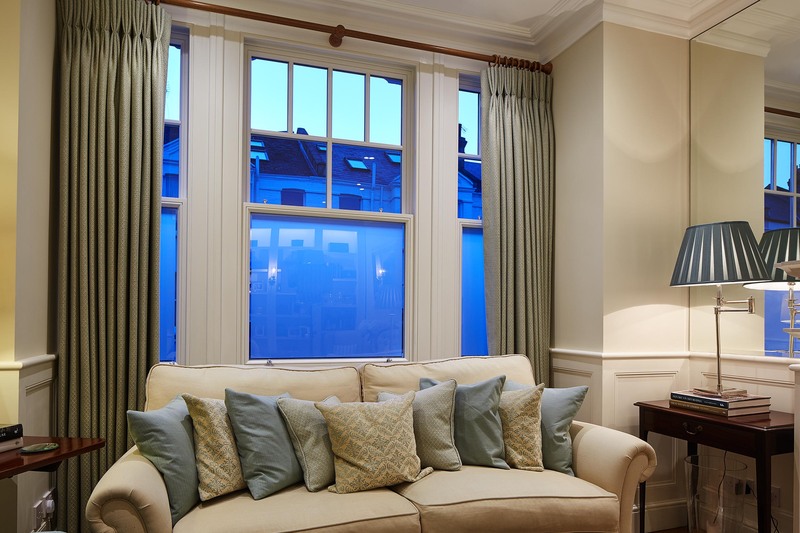 Soundproofed windows an in a wide range of styles, including sash windows, casement windows and French doors. This fits like a second skin over the area of the existing window. It attaches to the surface of the window trim or between the jambs of the window. This is an inexpensive option and the kits are easy to remove for the purpose of cleaning or maintenance. Each barrier can be up to four feet wide. A clear vinyl panel is applied to the frame of the window using Velcro, with a second panel attached to the perimeter moulding. This is also a more economical option, but it may not be appropriate for all styles of window. These blankets, manufactured specifically for this purpose, can be hung temporarily across a window and may be up to four feet wide. They should be fixed to the perimeter moulding to ensure minimal sound gets through. These blankets are easy to fit and take down but the obvious drawback is that, while they are in place, you lose the light from the window. Nobody is going to pretend that a box on your windowsill is going to prevent every last scrap of sound entering your home. However, if you are on an upper floor and the noise that is disturbing you comes up from a lower level or the street, a window box can be a useful barrier to sound waves that would otherwise have an unhindered route to your living space. Composed of mats made out of soundproofing material, these are made to fit snugly in your window frames to make a soundproof seal. Again, while this may be an efficient and cost-effective way of keeping sound out, it does mean you lose all the light from the window while they are in place. 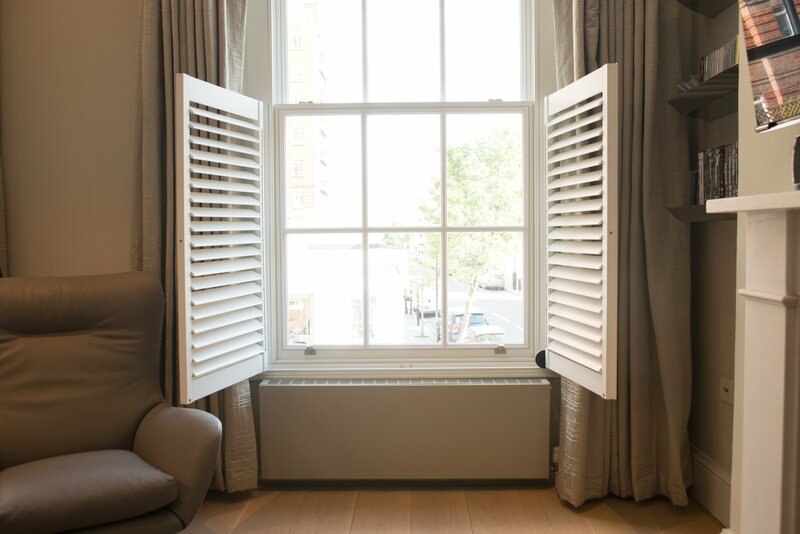 As well as having an old-world aesthetic appeal, shutters are an effective answer to the problem of excessive external noise. 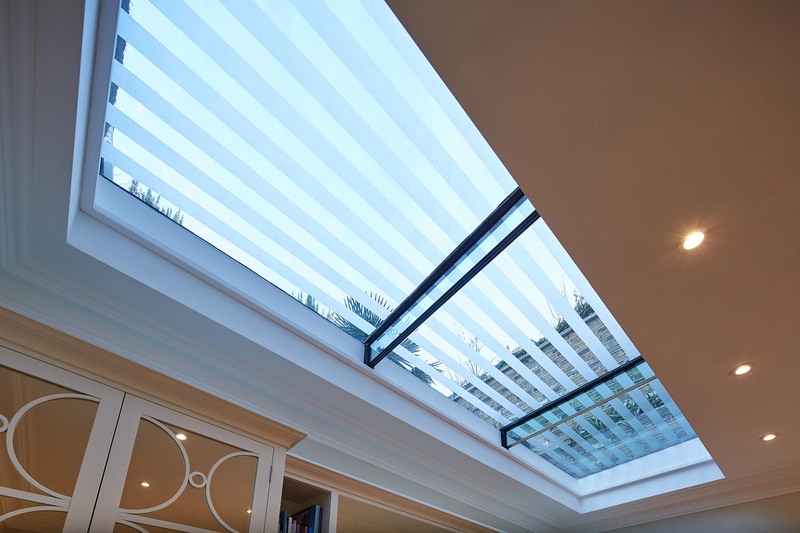 Available in a host of materials and styles, they offer a more flexible solution – but clearly, there might be some impact on the amount of light you will enjoy within your home. The second layer of glass positioned inside the actual window. When it comes to soundproofing, the larger the gap the more effective the solution will be; ideally, the secondary window should be at least 50mm (two inches) inside the external one. When closed, the secondary window should be airtight – and the heavier and thicker you can make the glass, the better. For many decades, before soundproofing techniques developed at the level they are at now, double glazing was the simplest answer to the problem of exterior noise. Even though double glazing was invented to reduce heat loss from homes, the fact that the second layer of glass acts as a supplementary barrier to sound from outside the home became a considerable fringe benefit. Double glazing remains an effective soundproofing solution, but it is also one of the more expensive answers to an eternal problem. As you can see, if you are considering soundproofing your home, or one particular room, there are several options open to you. Hugo Carter is a trusted and expert provider of soundproof windows. We work closely with clients to understand exactly what solution they need – then provide it. If you would like to speak with us about your soundproofing requirements, please get in touch today.